Naturally, there are many benefits to working from home, especially if you are a parent. These are just a few of the perks of working from home but there are many more. First of all, let’s talk about some of the potential work from home jobs that you might want to consider. Here is a long list of legitimate work from home jobs that you might not be seeing advertised on your local job hunting site. The best part is that many of these require little to no experience and you can get them started almost completely on your own. If blogging has ever sounded appealing to you, don’t think for a single second that it is not totally within your reach. I have been able to create consistent money making a blog from the ground up and I even created a course to teach you how you can do it too. Starting a job in this field can be nerve-wracking, that’s why Writers Work LLC has an all in one platform to help you find writing jobs, get published, find clients and even teach you how much to charge. Depending on your different state laws, opening your own daycare will look different for everyone. Watching kids all day is no easy task, but you stand to make some serious money in the process. Subscription boxes are wildly popular these days and you could get in on the action! Cratejoy is a company that helps you launch your site, finds your clients and supports you in the building of your own subscription box! Try a 2-week free trial – no credit card necessary. If you have experience with kids, there are several highly rewarding companies that are willing to pay you to teach English to children in other countries and set your own hours! SayABC is one of the best companies and they don’t require a Bachelor’s Degree! Because so much business is done online these days, there is a high demand for virtual assistants. This could mean checking e-mails, managing social media accounts or a wide variety of things. If you have any beneficial skills like these, it’s time to start marketing yourself as a VA. Similar to a virtual assistant, if you are something of a guru on social media you could be working for companies or influencers to help them build their social media following. Having your own thriving accounts or proof of other accounts that you’ve helped build in the past will be highly beneficial. Transcriptionists type up different documents and reports for different companies or individuals. If you are proficient in typing and have access to a computer, you have everything you need to start finding transcription jobs. Check out Transcribe Anywhere to get all the training you need to be successful as a transcriptionist. If you have a knack for numbers, getting a job as a bookkeeper would be a great work from home job idea. Read this interview from Ben, the founder of Bookkeeper Business Academy to learn exactly what it takes. I know, I know, we’re talking legitimate work from home jobs. The thing is, the idea of doggy daycare is becoming a more and more popular thing! I started working with Rover this year and still can’t believe I get paid to spend time with pups all day! Where your biggest earning potential comes in is if you are willing to watch more than one dog throughout the day. For example, if you watched 5 dogs per weekday at $30 a dog, you stand to bring in $3,000 per month! That’s a pretty significant income if you ask me. Did you know there are people who buy items on sale and re-sell them on Amazon at a profit? It’s true, and they’re earning over $100K per year.Get their free ebook to see how to start. Not only can you make money from AirBNB by renting out a room, but many people are able to turn this into a full-time business! If you have a home, cabin or a rental house, you could be making a major profit off of it by listing on AirBNB. Check out the AirBNB calculator to see how much you could be earning. If you have a passion for clean eating and helping people, then you could easily begin a career as an established health coach. It’s quick and easy to get certified online to gain all the tools you need. Becoming a travel agent is often something that does not require you to work out of an office. You can work for yourself or for a company to help compile people’s travel plans for them and get some serious travel benefits yourself! When my children were little I started an in-home photography studio in our basement (it sounds creepy I know.) All it takes is some good lighting equipment, a high-quality digital SLR camera and a lot of self-promotion. Smug Mug is also a great resource to help you set up an online portfolio for people to view your photos. If you have a talent for web design and all the behind-the-scenes technical talent, why not help others build their websites and make a handsome living for yourself? There is a high demand all year round for alterations and if you know your way around a needle and thread, you just might have yourself a work from home job! Prom and wedding season alone can be enough to keep a makeup artist busy all year long. If you have a knack for makeup, start reaching out and sharing this talent with everyone you know. Whether you create a space in your own home or meet people at their location, being a makeup artist can quickly turn into a full-time income. The great part about this one is that it is becoming easier and easier to do without any professional training or experience. While there are many different guidelines to follow for each state, there are a huge variety of ways to create a catering or baking business from the ground up! Chances are you know people who are killing it in the direct sales industry. 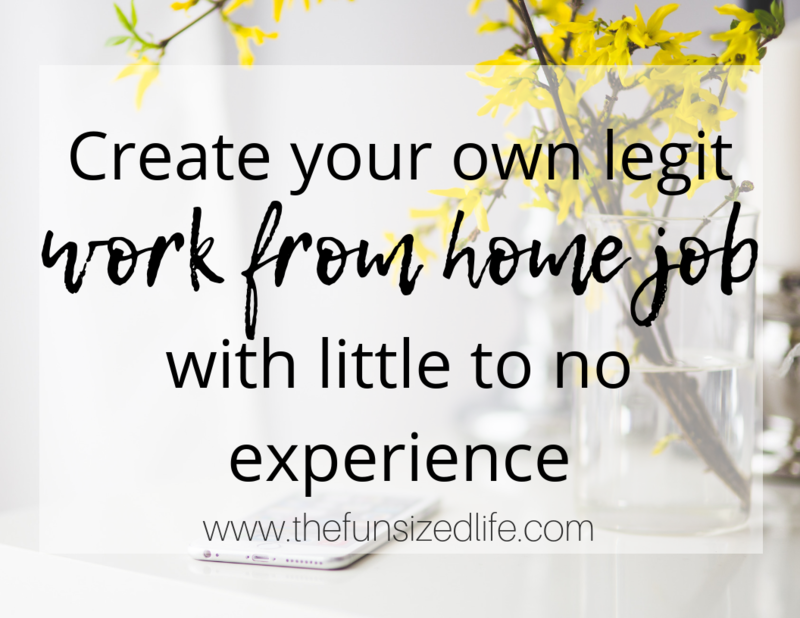 That does mean there is most likely going to be a lot of competition out there, but that doesn’t mean you can’t make a great work from home job doing it. Just make sure whatever product or service you are selling is something you support 100%. While Uber isn’t necessarily a work from HOME job, you do get to set your own hours, get paid up to 3 times per day and you can potentially take advantage of discounts on insurance and your phone bill. Get signed up today, or if you prefer, you can deliver food instead of people with UberEATS. Do you have some serious music abilities? Why not share them with the world? Teaching music lessons can allow not only major flexibility but a really good income as well! If you are a natural planner who lives for organization, thinking about planning big events like birthday parties or weddings might be a perfect job and you can do most of the organizing from home. When it comes time for the big event, you’ll definitely have to muster some hustle, but before that, it’s a lot of phone calls and planning. Are you a certified fitness instructor, or have you always wanted to be? Why not set up a gym or training studio in your own home? Stop paying the gym part of your commission and start bringing in money for yourself. If any of these legitimate work from home jobs sound right up your alley, that’s great. Remember, a lot of them still require a little hustle on your part. When you plan on building a business from the ground up, there are a few tips I have to ensure that you find success and start making a steady income. If I was going to be successful at blogging, then I had better learn from other bloggers who found success with their blogs. Take a moment to sit down and write down what kind of training you are going to need to be successful with your work from home job. If you want to be a photographer, maybe intern with a current photographer. Look for local camera classes or take in all the YouTube tutorials that you can! Training a great way to show the world that you are taking yourself and your business seriously. Just like at any other job, things need to run on a scheduled basis. Make sure you play around until you find one that works for you. Plan out your day step by step and do your best to follow a schedule. Keeping a schedule will help keep productivity up and encourage you to keep going. Back when I was doing photography it took months for me to call myself a photographer. I didn’t think anyone would take me seriously. The thing is, no one will take you seriously until you are taking yourself seriously. When you are first starting out, I think it’s huge to celebrate the small stuff. If you book one client or you make your first $10, then you’d better celebrate! Celebrate like you just won the lottery, because you kind of did. This will help keep your momentum going and keep your spirits up. No matter what you want in life, it’s going to require a little hustle. I worked (and still do) at it every chance I got. I took the time to examine other successful bloggers and learn from their strategies. Every chance I had to learn more or do better, I did it. Get a great strategy down and don’t be afraid to put numbers on paper. How many clients do you want to get this year? What date do you want to aim for to get your first paycheck? Layout these goals and then do your best to see them through! What do you think? Did I miss something? Do you have another super awesome work from home job that wasn’t discussed? Please share in the comments below!